We are living if the → new economy characterized by rapid unpredictable change and volatility. Volatility and chaos aren't bad or good – they are just realities. Foresight and change anticipation is a hallmark of → great leaders . 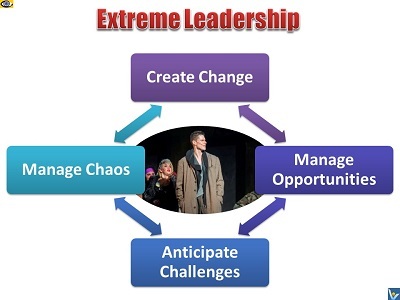 To guide your organization through volatile times, you must learn how to see the patterns in chaos and take charge, learn how to act boldly to safeguard your organization and lead it to a brighter future, and to alter your strategies to prepare for whatever the world may bring next. When John Browne became head of BP exploration in 1989 he was determined to create more value → more value for both → customers and shareholders. Although BP was successful, Browne knew that the world was changing and in the face of an uncertain future, the business had to become more adaptive. So what did he do? He did not call in the strategic planners or continue to restructure and rationalize assets. Instead, he took a more courageous step and decided to raise the creative tension. Moving with, rather than against, the increasingly heightened turbulence of the early 1990s, Browne established the preconditions necessary for creating such tension and deliberately moved the organization to a situation that was at the edge of chaos. That is, the point at which a natural equilibrium is found between chaos and order, comparable to the conditions in the evolving natural world. Browne and his team were consciously evolving BP into an adaptive organization, one that would be better able to survive and prosper in today's uncertain and turbulent times.